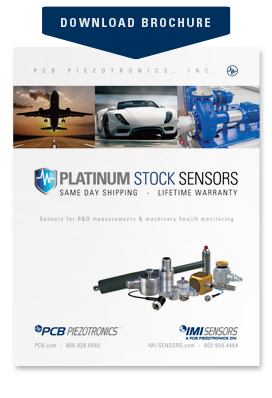 PCB® Platinum Stock Products – Over 10,000 Sensors In-stock, Ready to Ship! Our Platinum Stock Products program is one of the ways we live up to our Total Customer Satisfaction guarantee. Platinum means we guarantee inventory levels of more than 10,000 sensors so we can deliver the products you need, when you need them—and you can meet your test and measurement goals. Through our Platinum Stock Products program, you can expect the same high quality and exceptional customer service you receive when you purchase any PCB® product, but in addition you can count on faster delivery times and the industry’s best warranty. If you are not 100% satisfied with any Platinum Stock Product, simply send it back. We’ll repair or replace it, guaranteed. No questions asked!